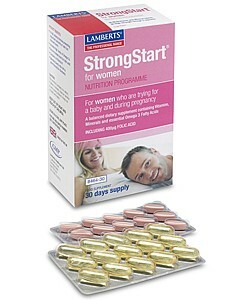 Lamberts Strongstart for Women - A multivitamin and mineral health supplement with carefully balanced essential micronutrients designed to be taken before and during pregnancy. For women who are trying for a baby and during pregnancy. Health supplement carefully balanced essential micronutrients designed to be taken before and during pregnancy. Lamberts® StrongStart® for women supplies all of the important micronutients at levels that are higher than most typical ‘high street’ products. Inadequate intake of micronutrients in women has been linked to a number of health problems including impaired immune response, anaemia, tiredness and low birth weights. The principle of using dietary supplements before conception is established by the DoH recommendation that all women trying to conceive should take a folic acid supplement. This in effect recognises the risk of dietary deficiency in the general public and the advice is supported by the fact that the folic acid intake is below the RNI for most women. Indeed many other micronutrients are also below the RNI which is why many nutritionists recommend a comprehensive multinutrient product to provide a broad spread of micronutrients. StrongStart® for Women supplies all of the important micronutients at levels that are higher than most typical ‘high street’ products but still safe for use before and during pregnancy as well as when breastfeeding. The Programme consists of one multinutrient tablet per day plus one Omega 3 capsule, the latter of which provides a higher level of omega 3 essential fatty acids than most other fish oil products available. Cellulose Tablet Coating (Hydroxypropyl Methylcellulose Glycerin Colours: Titanium Dioxide & Iron Oxides) Silicon Dioxide Stearic Acid Crosslinked Cellulose Gum Magnesium Stearate. Tablet less than 1 hour / capsule less than 30 minutes. None known at the recommended usage. This product contains Iron which if taken in excess may be harmful to very young children keep out of sight and reach.